Ghani - Dr.Abdul G. Munsiff - meherbabatravels jimdo page! 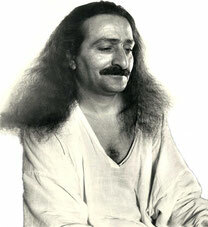 1932 : Meher Baba at Harmon, New York. Dr. Ghani is next to Baba in the brown suit. Colourized image. 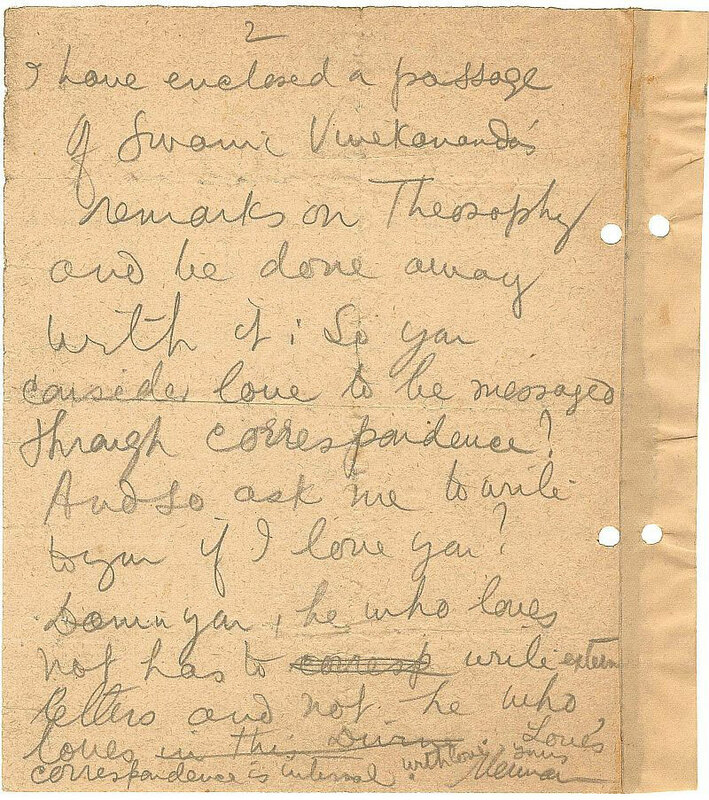 In this very special Heart Talk series from the Avatar Meher Baba Trust Archives at Manzil-e-Meher, Meherabad, we are posting some early correspondence from Baba to Dr. Ghani and sometimes Ramjoo Abdulla, both early members of the men mandali. 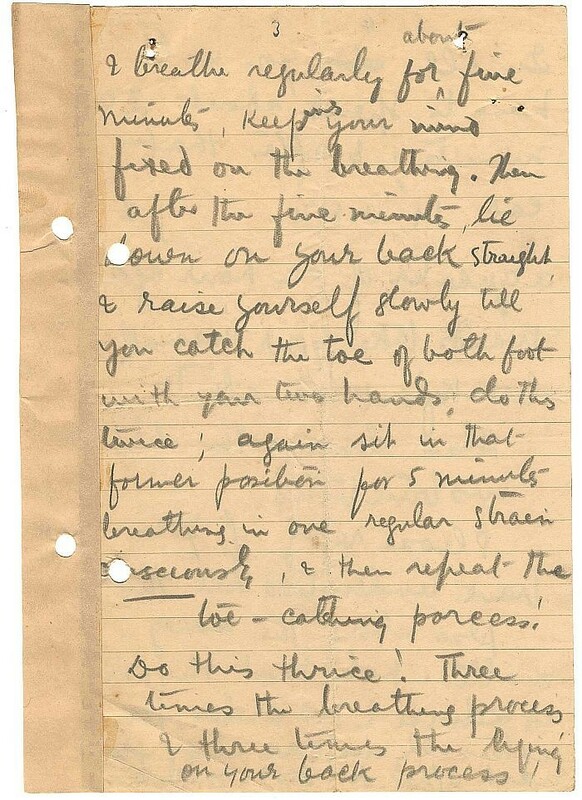 This is the first time we have posted images of these precious and rare letters in Baba's handwriting, and while reading them is not always easy, it is quite a different experience from reading transcripts. 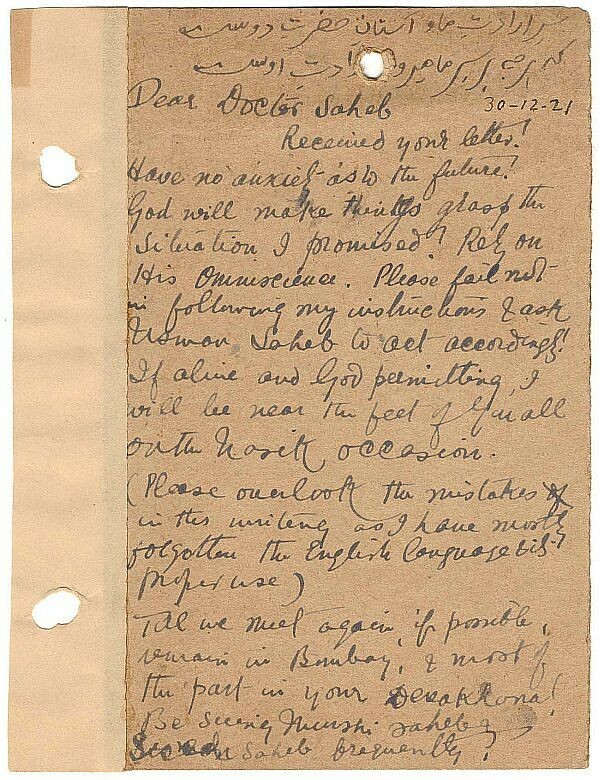 Baba gave up handwriting on 2nd January 1927. 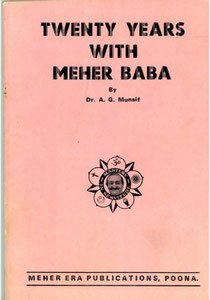 Most of the information about Dr. Ghani is derived from Dr. Ghani's Twenty Years with Meher Baba published in the Meher Baba Journal 1940. The rest comes from informal chats with mandali members who knew him. Dr Abdul Ghani, known as Doctor, was born in the same year as Baba and as a child lived near Him in Dastur Meher Road in Poona where Baba spent His childhood. 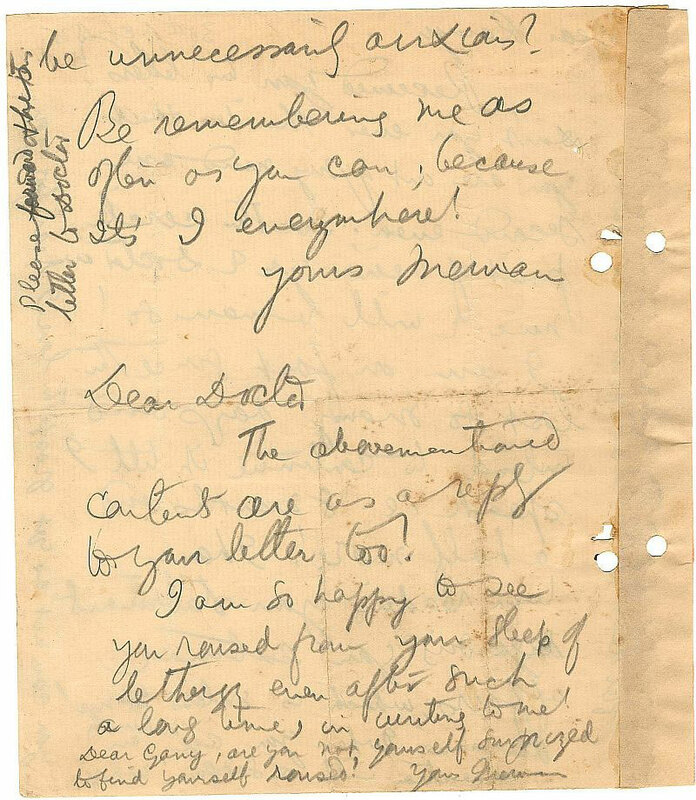 They were playmates and friends from childhood to college, with a deep attachment forming between them early in their lives, hence the term "langoti friends" which Baba uses to refer to their friendship in some of these letters. A langote is a diaper (or for adults a loincloth) and in this context means a bosom friend since infancy. Baba and Ghani went to school and college together and on leaving Deccan College, Ghani joined the Medical College of Poona, but left without graduating, and instead he studied homeopathy, obtaining the Calcutta degree of L.H.M.S. 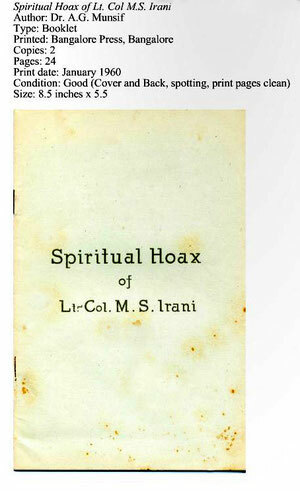 He was a practicing homeopath in Mumbai when in 1920, after of lapse of almost 6 years, he again met Baba in Poona at a friend's home (Munshi Abdul Rahim, one of Baba's early mandali). Not knowing Baba's status, Ghani embraced Him very chummily as his long-separated friend and Baba responded in a like manner. Dr. Ghani quickly became aware that his old friend was now regarded with great reverence and respect. Baba slowly reeled him in, resulting in Dr. Ghani's attitude towards Baba changing completely from levity to seriousness. He gradually came to accept Baba and decided to follow Baba's advice and instructions implicitly, so when Baba advised him to dust and sweep his dispensary in Mumbai himself for six months, he did, thus sweeping his medical practice clean out of existence! He joined Baba at Manzil-e-Meem and then settled in Lonavla, still frequently joining Baba at Meherabad, for tours or wherever He was. Dr. Ghani married, had several children and struggled constantly to manage expenses. Later he settled in Poona, where he lived for many years. So Doctor was Baba's chum, and had the special privilege of always having access to Baba, who enjoyed his humour, wit and intelligence and who gave him a latitude not enjoyed by most of the mandali. Baba took him along on the first part of the New Life, which he bravely faced despite his health and other difficulties. Doctor had a considerable intellect and it was he who wrote the "Song of the New Life" from the first couplets given by Baba and to whom Baba gave many explanations that later contributed towards the explanations in the Supplement in God Speaks. 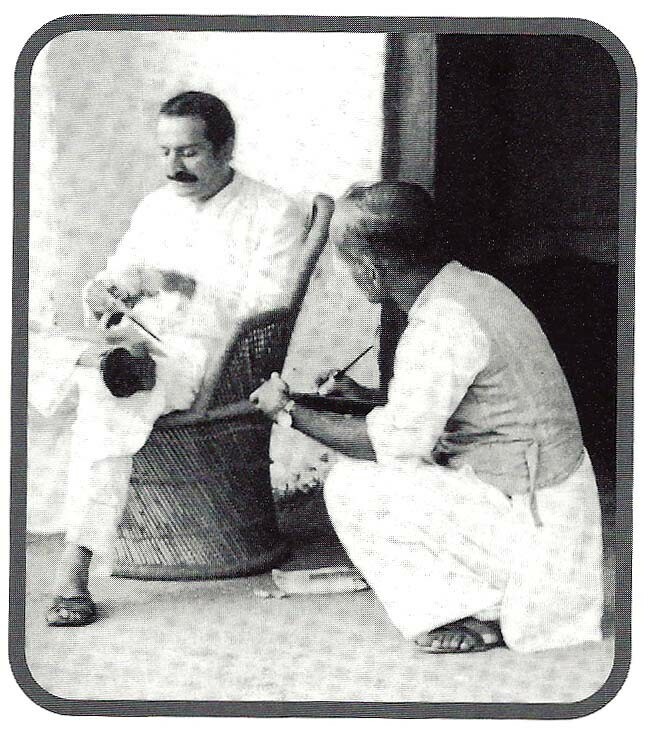 He died in 1951, shortly after returning from the New Life. The translations given of Hafiz in the introductions to the postings are more literal than poetic — if the poets amongst you would like to send us poetic versions, please do. 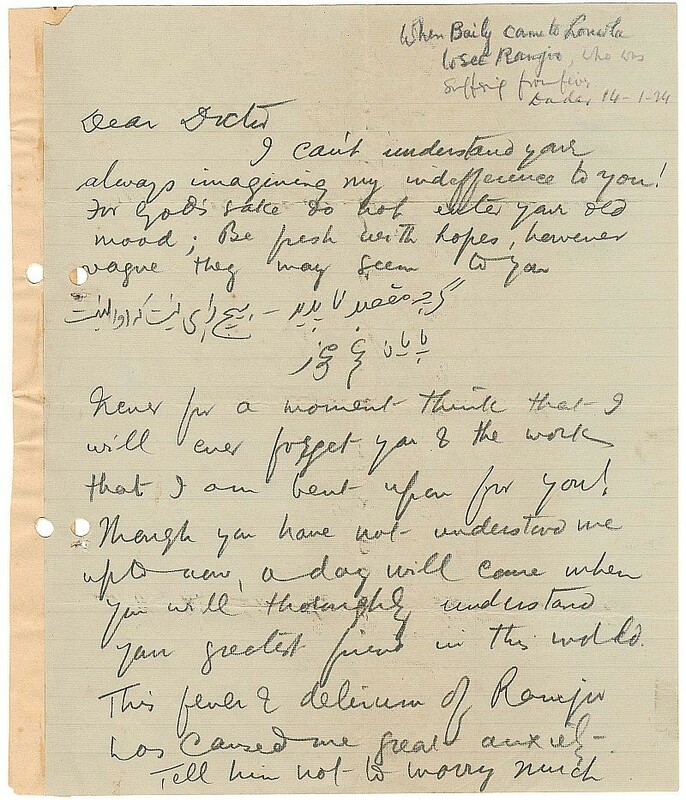 The first letter in this series of correspondence between Baba and Dr. Ghani is a postcard from Baba to Dr. Ghani. 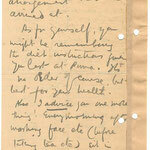 It is in Baba's handwriting and dated 19 December 1921. It is thought to have been written from Sakori towards the end of Baba's last long stay of six months with the Perfect Master, Upasni Maharaj. At the time Dr Ghani was at his homeopathic clinic in Bombay. 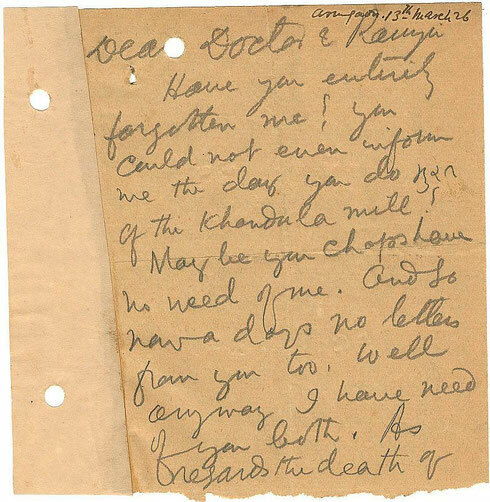 This week's posting is a letter from Baba to Dr Ghani, whom Baba addressed as "Doctor Saheb." 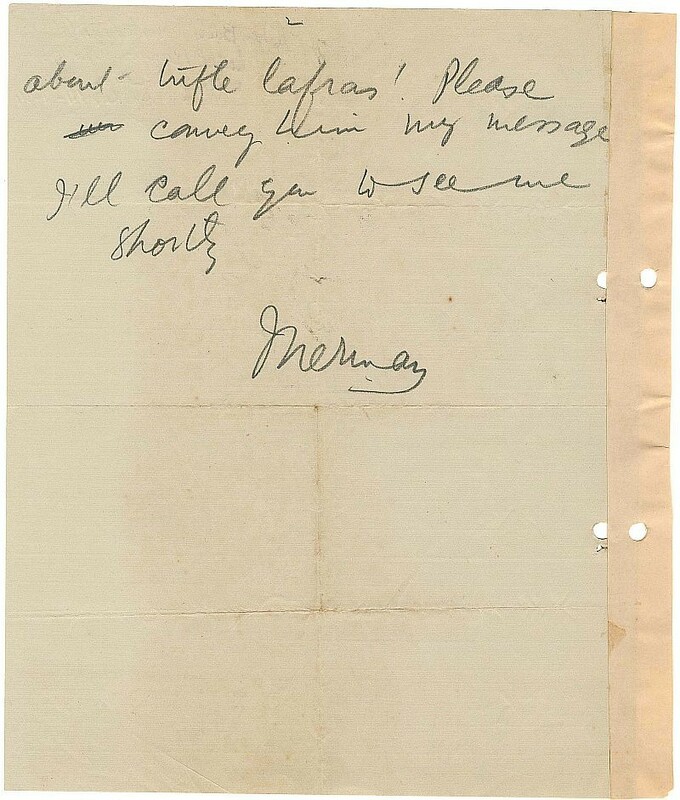 It is dated December 1921. Baba is near the end of his six months stay with the Perfect Master, Upasni Maharaj in Sakori; Dr. Ghani is in Bombay at his homeopathic dispensary. 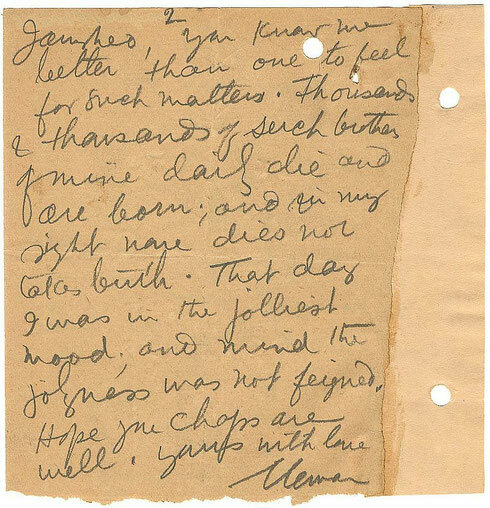 It is in Baba's handwriting. 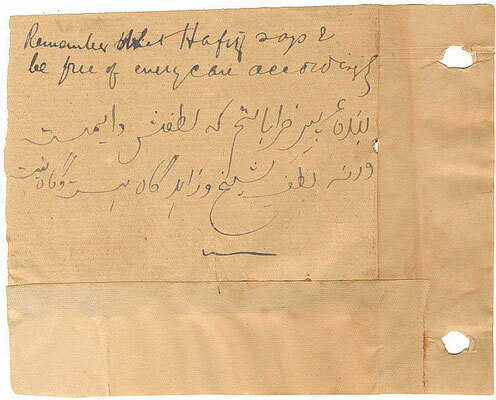 A little background ... Ghani had written to Baba that he intended to travel to their hometown of Poona, along with a few other companions, to participate in a nyaz (or nazar) dinner — a free meal given by mosques on certain nights of the Muslim festival of Muharrum. 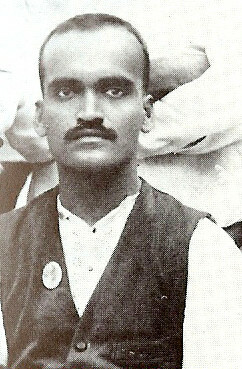 Usman Saheb, a friend of mandali member, Ramjoo Abdulla, was an early mandali member, as was Munshiji and his close circle of friends. Whereas the kindness of the sheikh and the pious is sometimes there and sometimes not. This Heart Talk from Baba to Dr. Ghani is dated 30 December 1921 and was hand-written by Baba from Sakori at the end of His last long stay (of 6 months) with Upasni Maharaj. 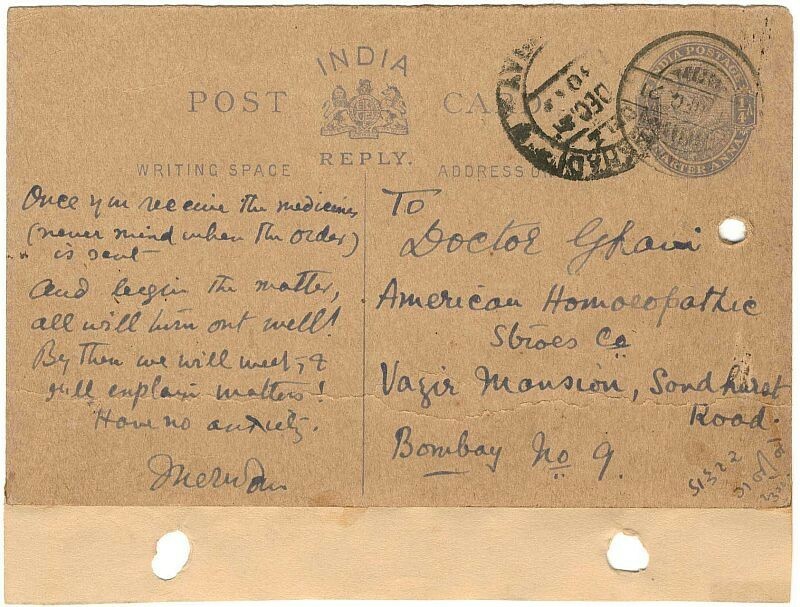 It seems that Baba was postponing a meeting in Nasik mentioned in the postcard. 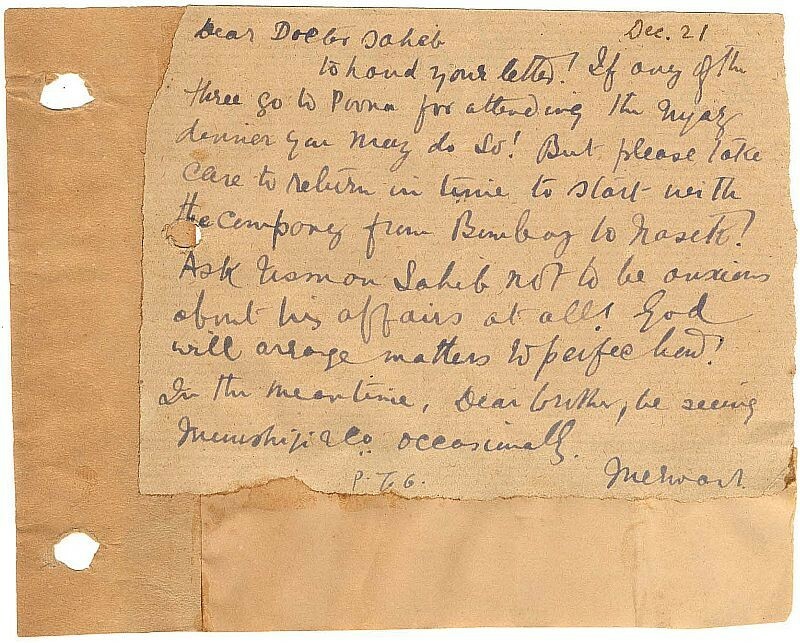 We have no record of Baba making any trip to Nasik in the first few weeks of January 1922. After He left Sakori in January 1922, Baba came to Bombay and stayed at a close one's (Munshi's) house. Visiting Ghani's dispensary (dawakhanna) one day, Baba advised Dr. Ghani to sweep it himself, promising that after a few months his luck would change. It was unheard of for a doctor to sweep his rooms and through this Ghani was "swept out" of his dispensary, which closed, to be with Baba. Because whatever we are passing through is His Will, His Kindness and His Friendship. The other Indian script is Gujarati in the letter and translates as "should reach Dr. 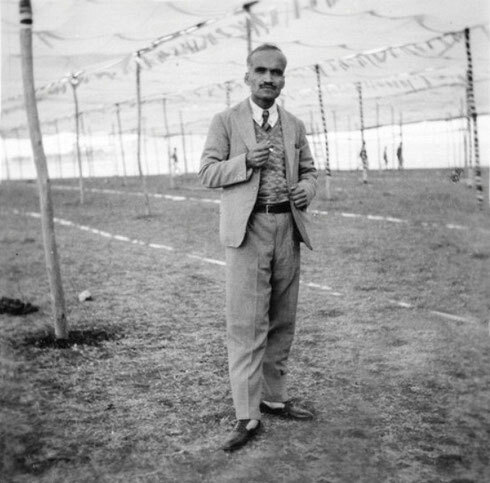 Ghani." 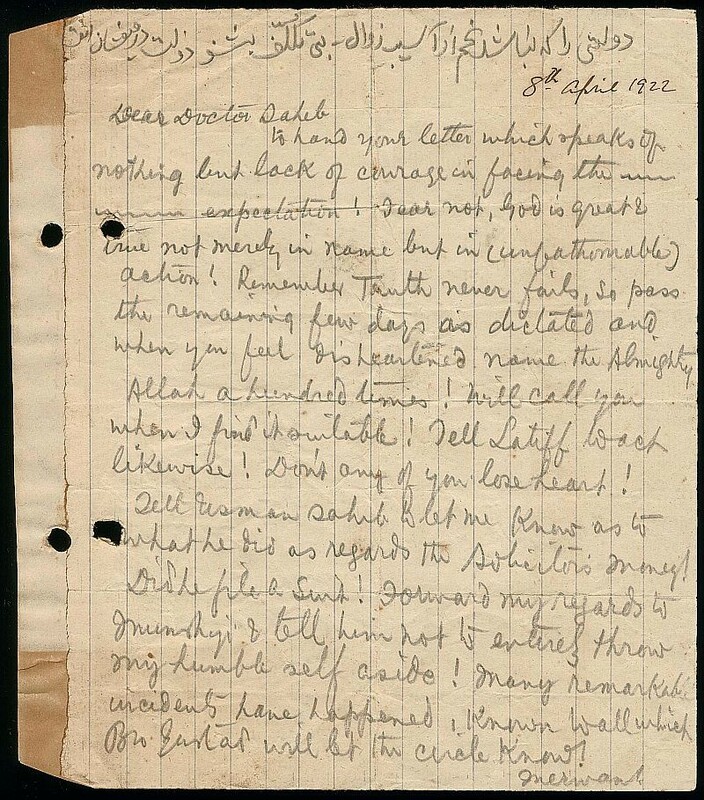 This week the Heart Talk posting dated 8th April 1922 is a long early letter in pencil in Baba's handwriting to Dr. Ghani and other close Muslim followers of Baba in Bombay. 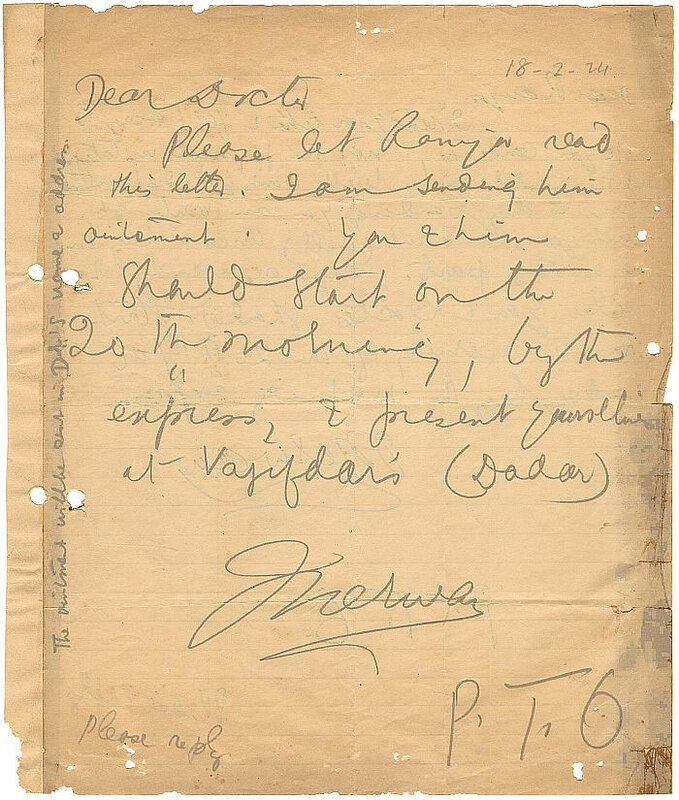 It was written during the period of Baba's stay in the jhopdi (hut) on Fergusson College Road, Poona. 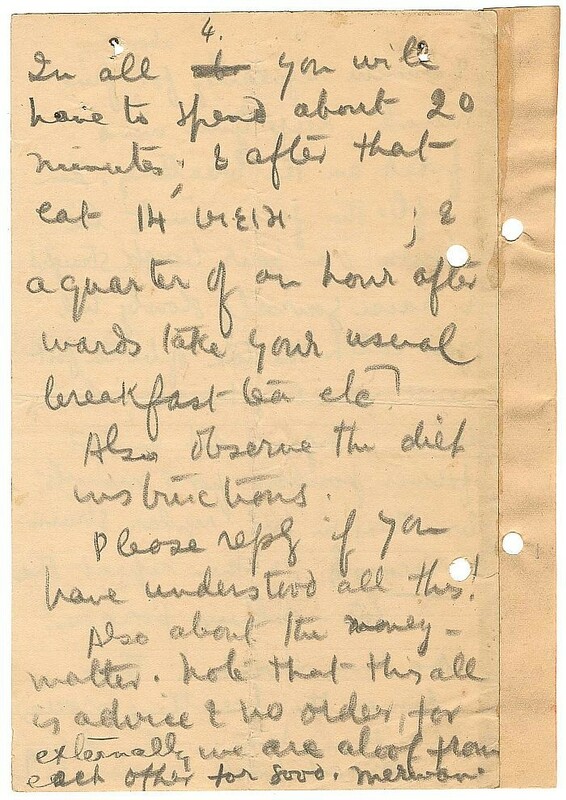 It is not easy to read, but worth the effort. Latiff was a school friend of Baba and Ghani's; "Bro[ther] Gustad" is Gustadji; Sayyed Saheb was one of the early mandali members. 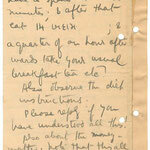 The reference to someone named "Shamsh" is not known. Just listen, is the kingdom of Dervishes. 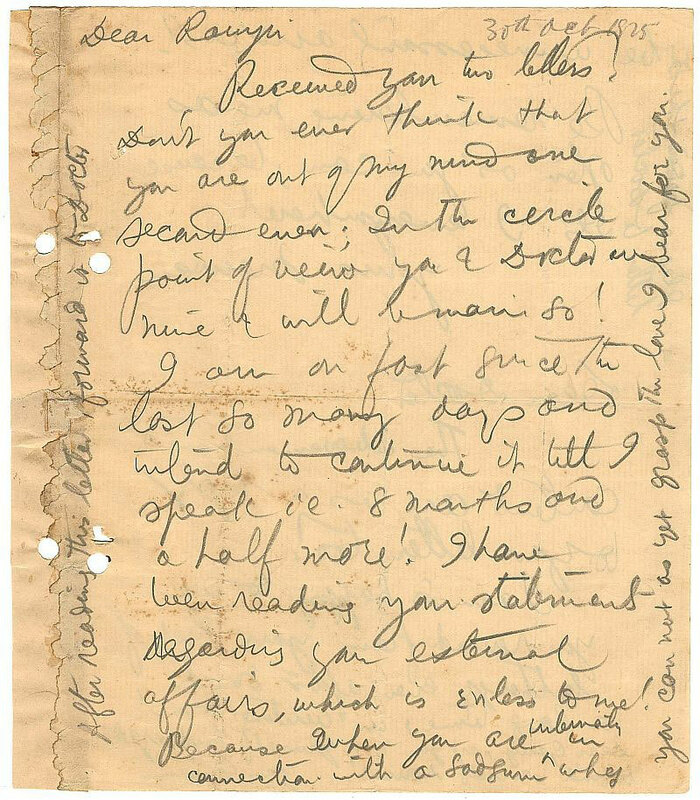 The Heart Talk letter this week, dated 28th July 1922, was dictated by Baba from Manzil-e-Meem in Bombay, so it is not in His handwriting. After dictating it, Baba left for Sakori with Khak Saheb and another of the Urdu-speaking mandali to gather information about Upasni Maharaj and Sai Baba for the Urdu version of a biography of Upasni Maharaj. It was a four or five day intensive trip. 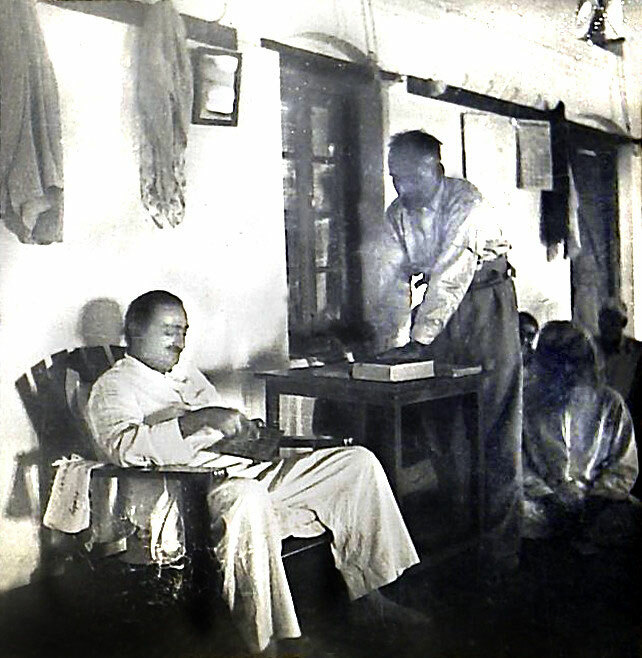 Gustadji, whom the mandali were instructed to obey in Baba's absence on this trip, was regarded by the early mandali to be Baba's closest disciple. During that period Baba commented, "To bow down to Gustadji is the same as to bow down to Me." 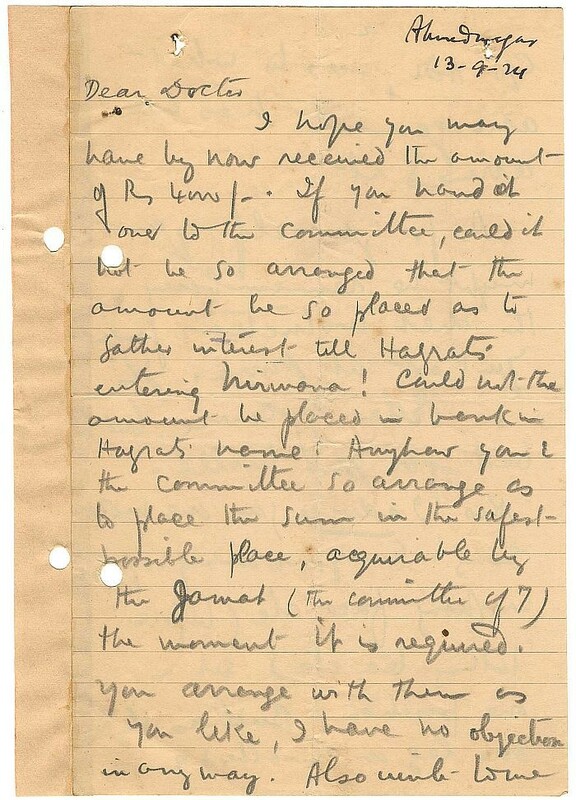 The seven orders mentioned in the letter were the first orders given and agreed upon by the Manzil-e-Meem companions in May 1922. 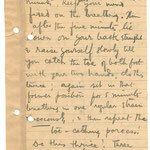 The Heart Talk offering this week is a letter to Ghani in Baba's handwriting and is written in pencil. 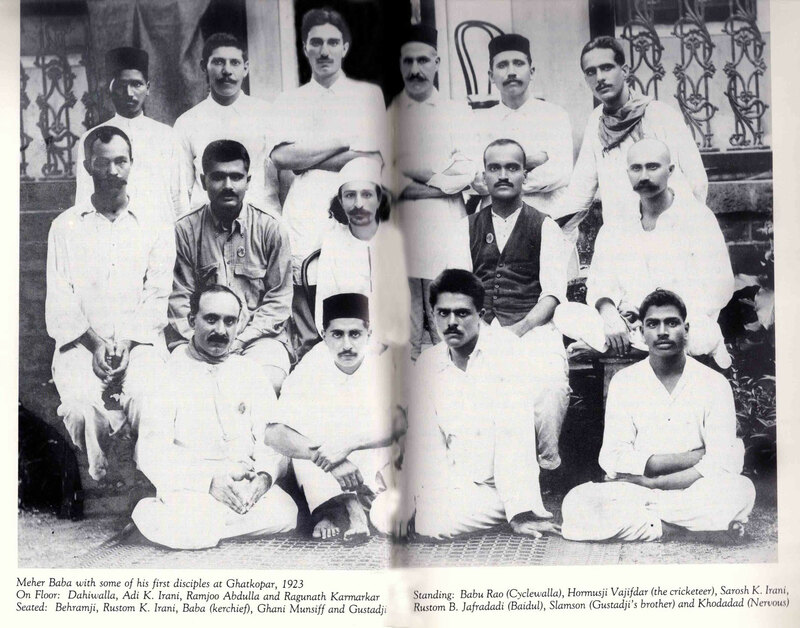 Baba at this time was at Khushru Quarters, Adi K. Irani's family home in Ahmednagar. It is dated 29 April 1923, which is one day before Baba took the mandali to Happy Valley, near Ahmednagar, where Baba gave Padri and Pendu their nicknames. 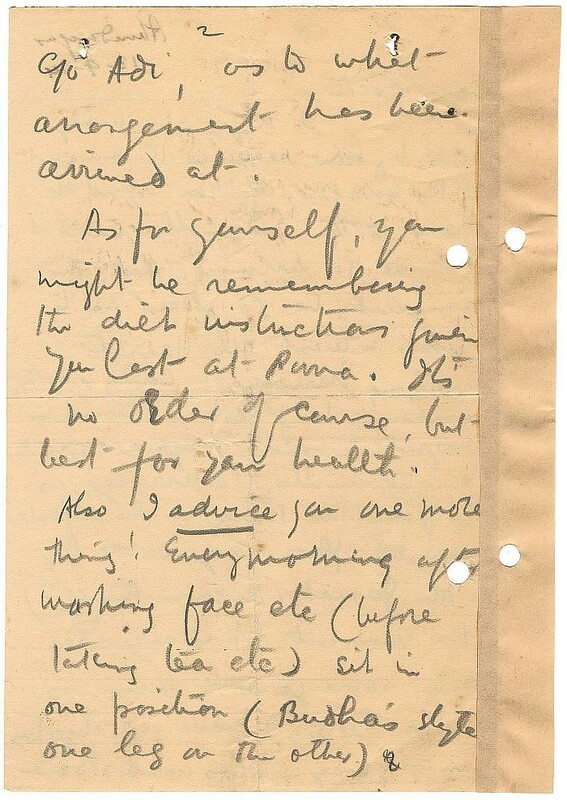 Because it is exceptionally hard to read, we have included a transcript. 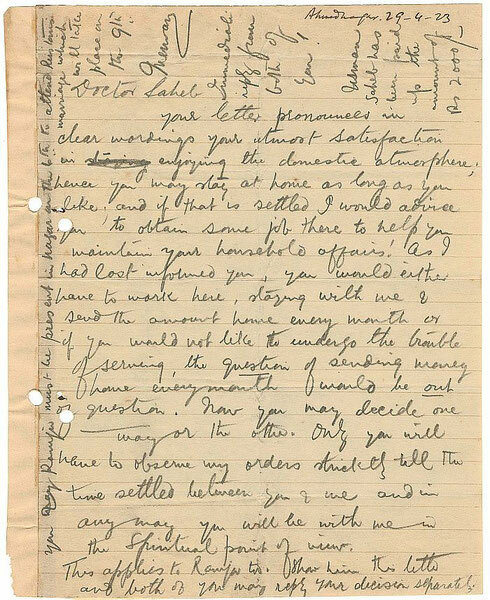 Your letter pronounces in clear wordings your utmost satisfaction in enjoying the domestic atmosphere; hence you may stay at home as long as you like; and if that is settled I would advise you to obtain some job there to help you maintain your household affairs! As I had last informed you, you would either have to work here, staying with me & send the amount home every month or if you would not like to undergo the trouble of serving, the question of sending money home every month would be out of question. Now you may decide one way or the other. Only you will have to observe my orders strictly till the time settled between you & me and in any way you will be with me in the Spiritual point of view. This applies to Ramjoo too. Show him this letter and both of you reply your decision separately. 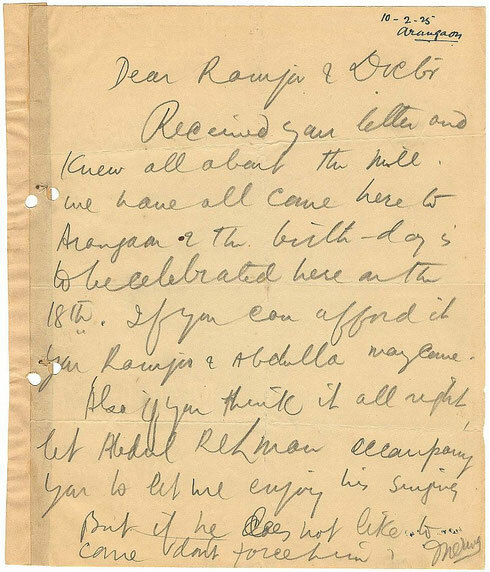 You [&] Ramjoo must be present in Nagar on the 6th to attend Rustom's marriage which will take place on the 9th. Usman Saheb has been paid up the amount of Rs 2000/-. 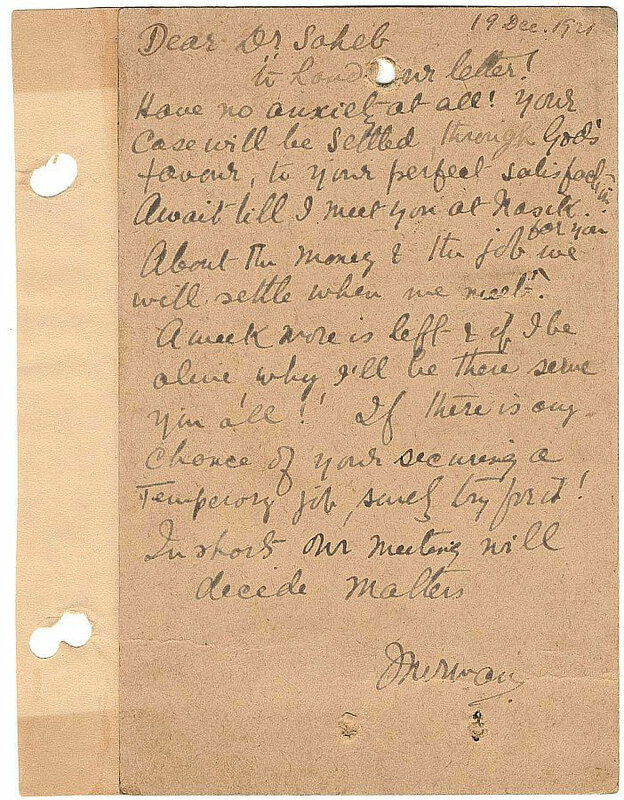 [NOTE: The last part of this letter, including the signature, was written in the left hand margin and along the top of the letter]. 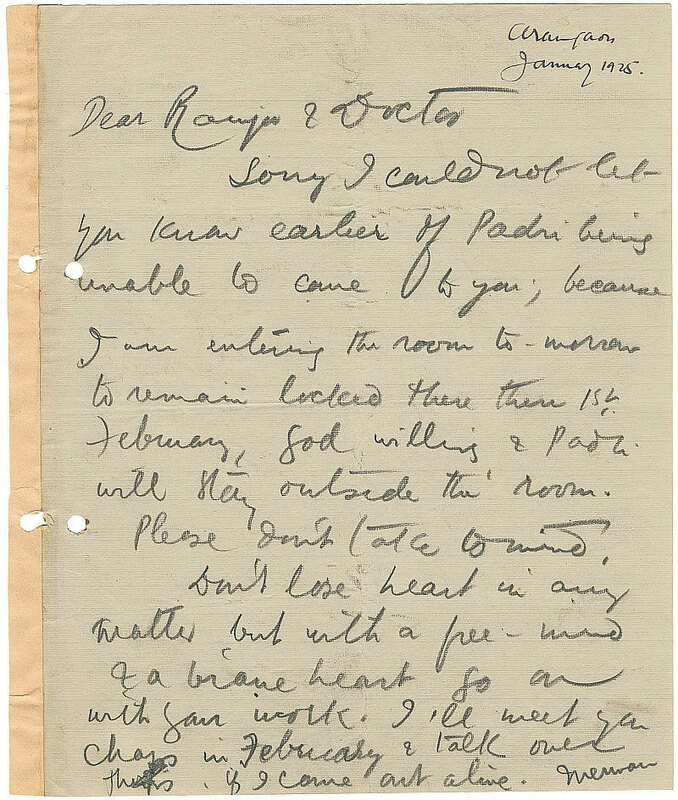 This week's Heart Talk is a note, dated 3 January 1924, written by Baba to Dr. Ghani from the Barucha Building in Dadar, Bombay, where Baba was staying with Gustadji and Behramji. Ramjoo was suffering from excruciating eczema during this period. 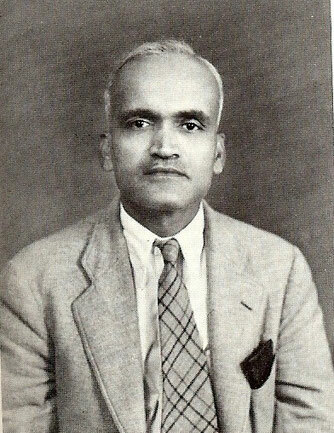 Homi Vajifdar was an early follower from Bombay. 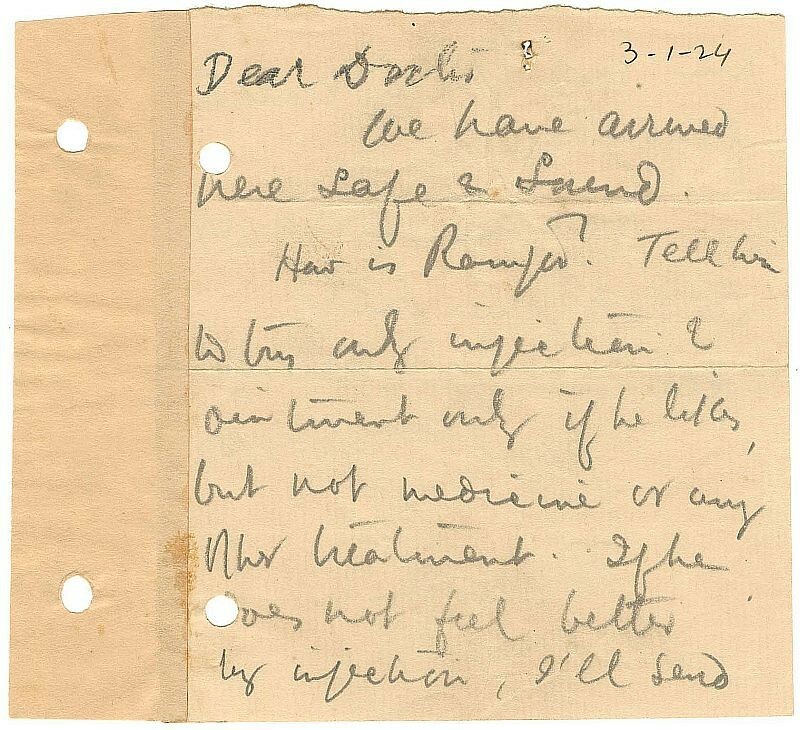 The Heart Talk this week is another handwritten letter from Baba to Doctor Ghani and is dated 14 January 1924. Baba's concern about Ramjoo expressed in last week's Heart Talk continues. 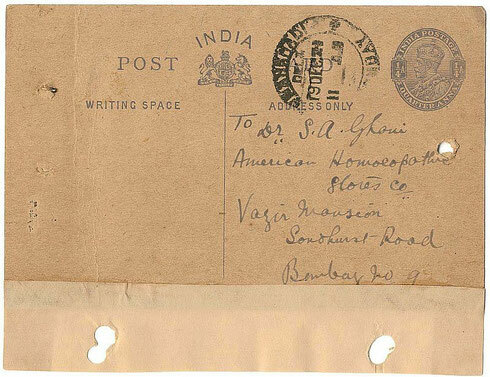 It was written at the Bharucha Building in Dadar, Bombay, where Baba was staying with Gustadji and Behramji. 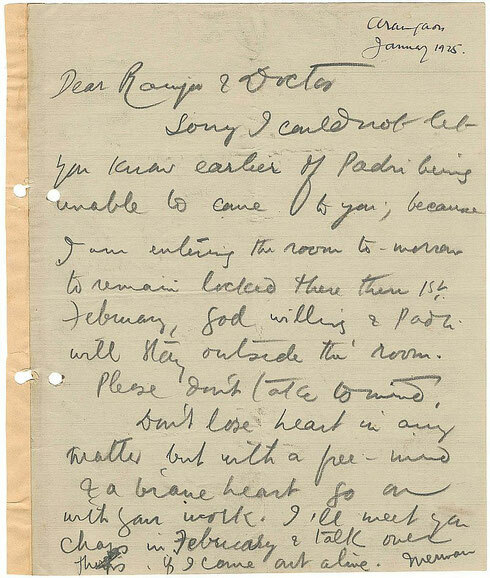 This week's offering on Heart Talk are two hastily written notes from Baba — one to Dr. Ghani and one to Ramjoo, dated 18 February 1924. 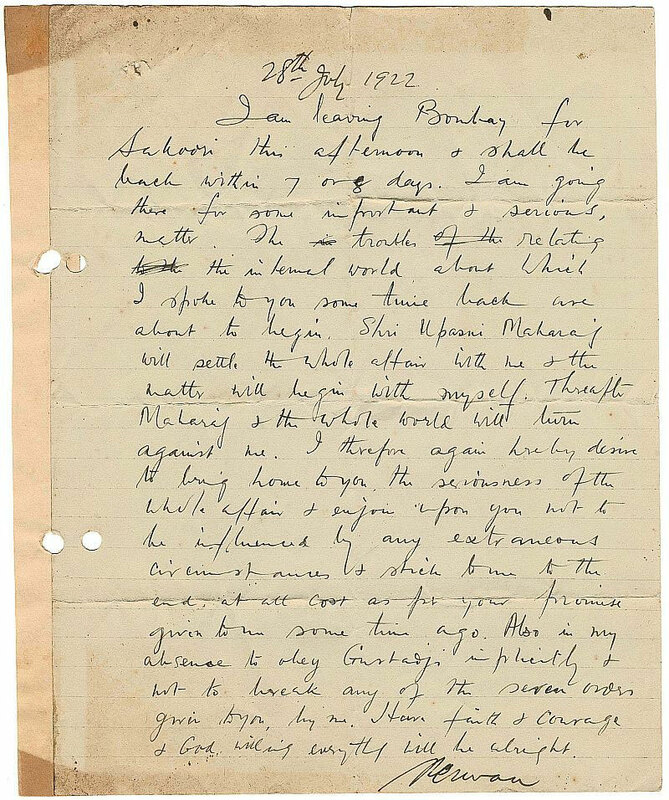 Apart from commiserating with Ramjoo's concerning his unbearable skin condition, Baba is calling them both to Bombay to meet Him before he leaves with eight men on His first trip to Persia on 22nd February 1924. 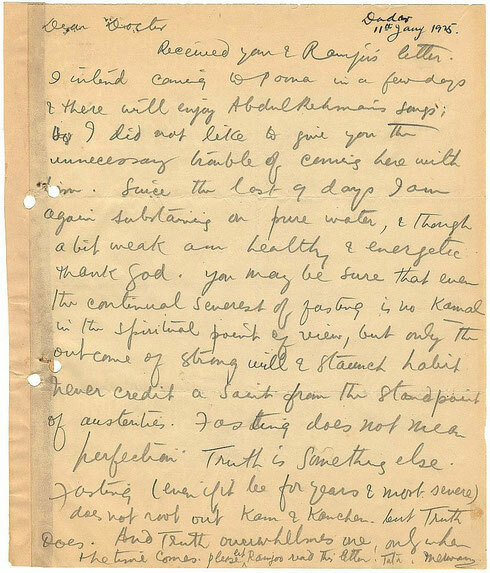 This week's Heart Talk posting was written by Baba at Khushru Quarters, Ahmednagar and is dated 13 September 1924. This was Adi and Rustom Irani's family home and is now known as Meher Nazar. It accommodates the Trust Office, the Ahmednagar Baba Centre and Bhauji Kalchuri and his family. In the letter, Baba is giving Ghani directions about holding the sum of money reserved for building Babajan's tomb after she drops her body and is proof (in His own hand) that Meher Baba Himself took the initiative to have Babajan's tomb-shrine built. This is important because about ten years ago the original top shrine construction was demolished and another built in its place. 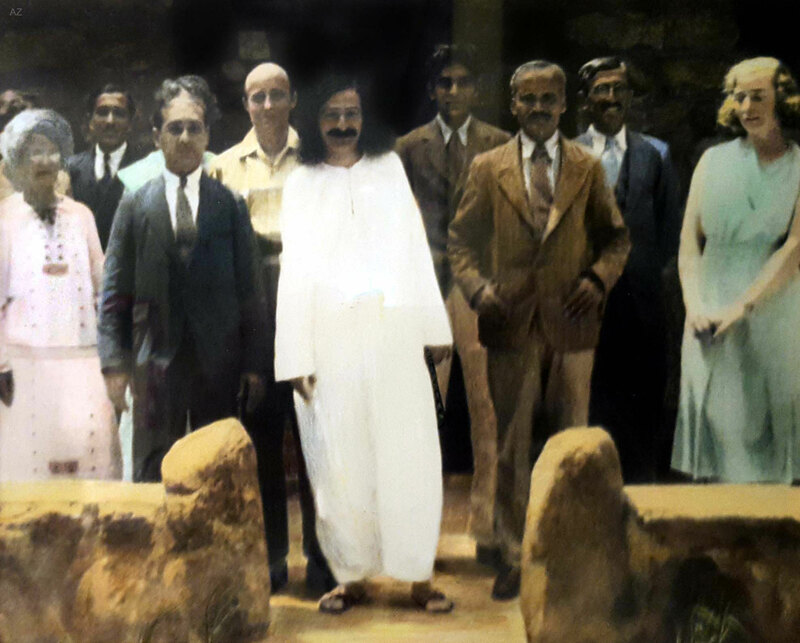 Since that time Meher Baba's photograph has been removed from Babajan's tomb-shrine. 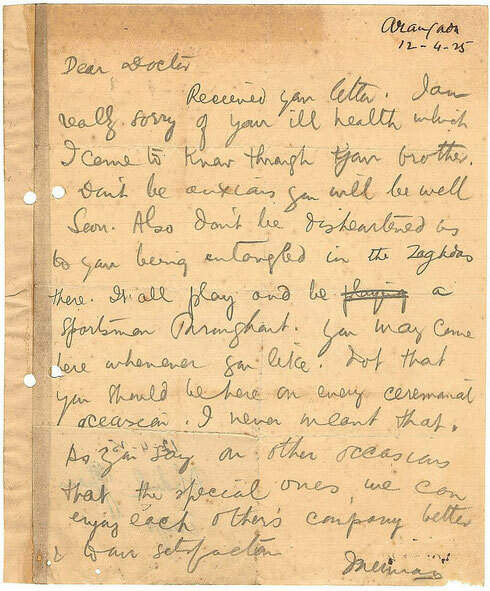 Regarding the last paragraph, Baba is rubbing in the fact "externally we are aloof from each other for good". During this period Ghani and Ramjoo found the life with Baba very hard and often stayed away from Him, yet they would sometimes complain about their difficulties in worldly life. So Baba made it known to them and the other mandali that He had severed external connections with them and their families. The Heart Talk offering this week continues Baba's correspondence with Dr. Ghani. 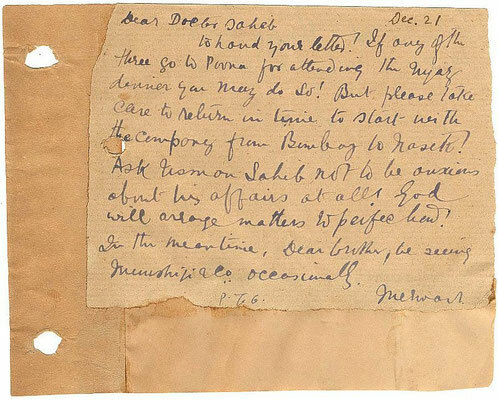 This letter is dated 11 January 1925 and was most likely written from the Bharucha Building in Dadar, Bombay, where Baba stayed with His men and women mandali until He returned to Meherabad later that month for the 'First Long Stay'. Abdul Rehman was Ghani's brother who sang in the style of music Baba liked at that time. The meaning of "kamal" is something praiseworthy. 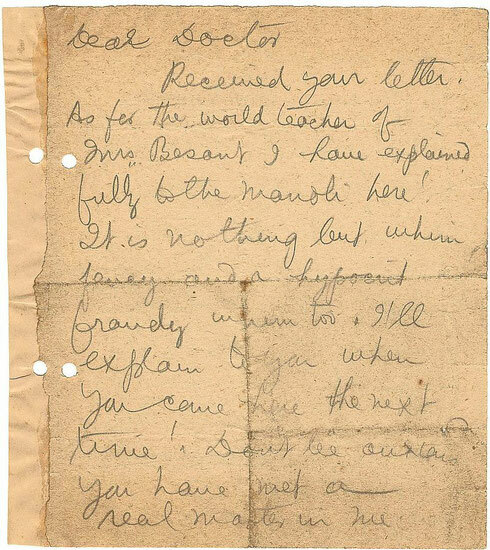 "Kam and Kanchan" mentioned in the letter mean "lust and greed." 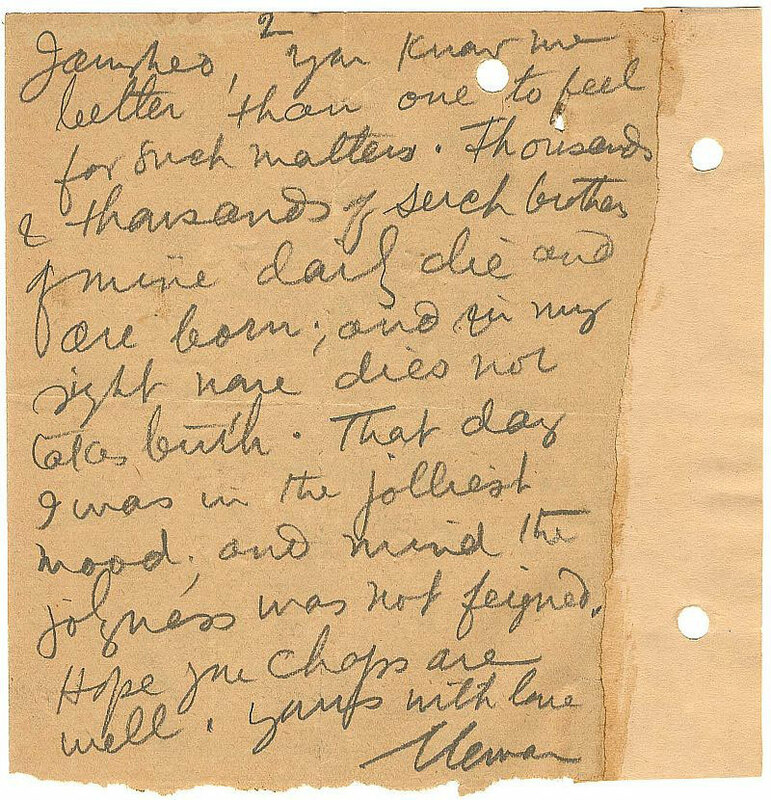 "Tata" is an informal, English expression that means "good-bye." This week's Heart Talk is a handwritten letter by Baba in Arangaon (Meherabad) to Ramjoo and Ghani. 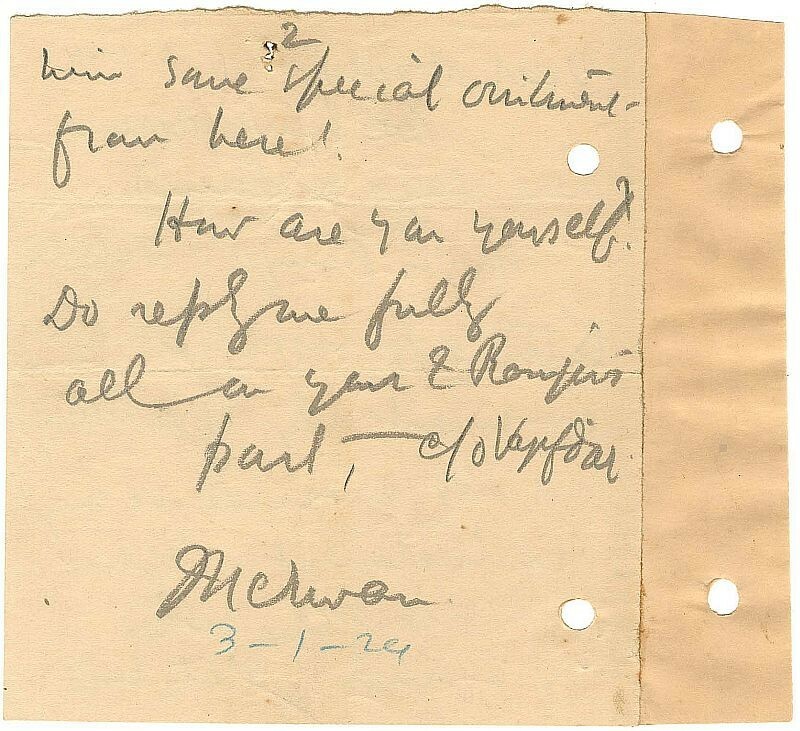 It is dated January 1925 — probably around 26th — at the beginning of His first long stay at Meherabad. 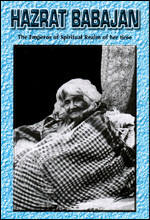 There is no other record of this short seclusion in the Jhopdi that we know of. 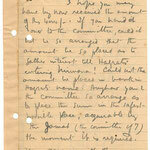 The offering from Heart Talk this week is written by Baba from Meherabad and dated 10th February 1925. 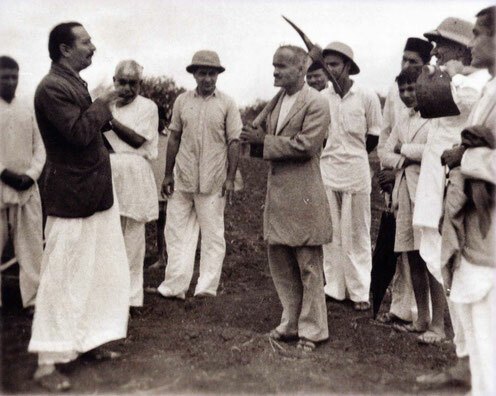 Dr. Ghani and Ramjoo were living in Talegaon-Lonavla (between Poona and Bombay) during this period. Baba's Birthday celebration was held this year on the 18th of February as in the Gujarati calendar birth dates vary from year to year. 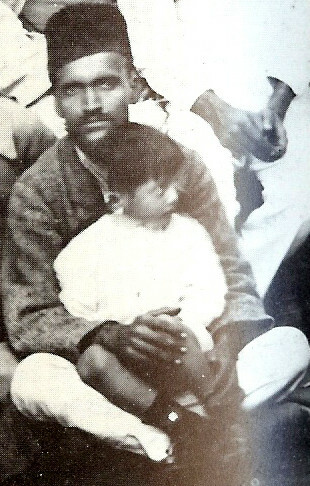 Abdullah is Abdullah Jaffer, the husband of Ramjoo's sister and Abdul Rehman is Ghani's brother. They all attended the celebration. 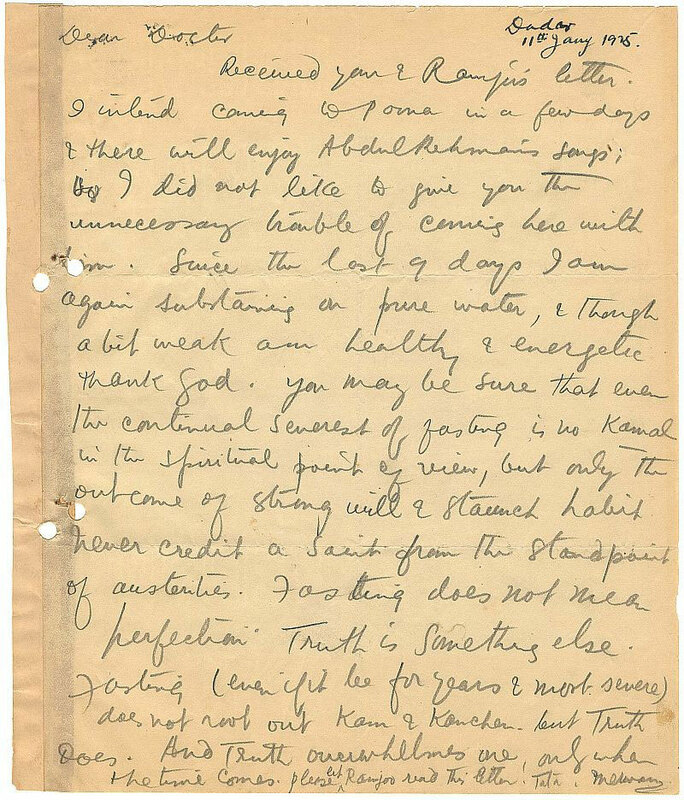 In this week's Heart Talk, dated 12 April 1925, Baba is living at Meherabad. Ghani's brother, Abdul Rehman, had come to Meherabad on 2nd April that year to sing Qawalis during the celebration of Ram's birthday there. "Zagkdas" means "quarrels". Two days after this letter was written, Baba left for Bombay to personally purchase material for uniforms for the children attending the Hazrat Babajan school that had opened on 25th March 1925 at Meherabad. 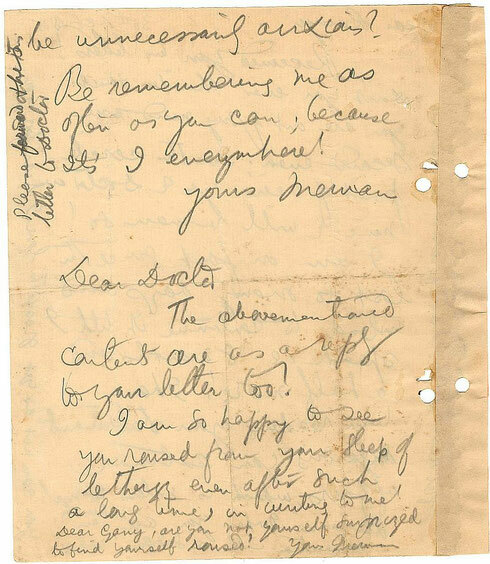 This Heart Talk dated 30 October 1925 is the first letter posted in this series after Baba had begun His Silence. 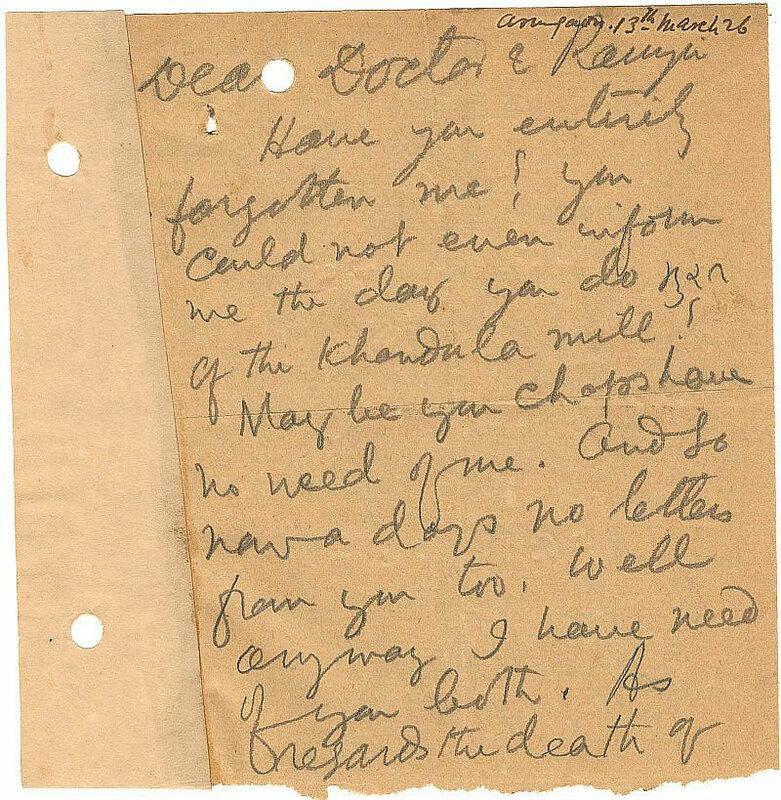 It was written by Baba at Meherabad to Ramjoo and Dr. Ghani who both were living in the Lonavla area. 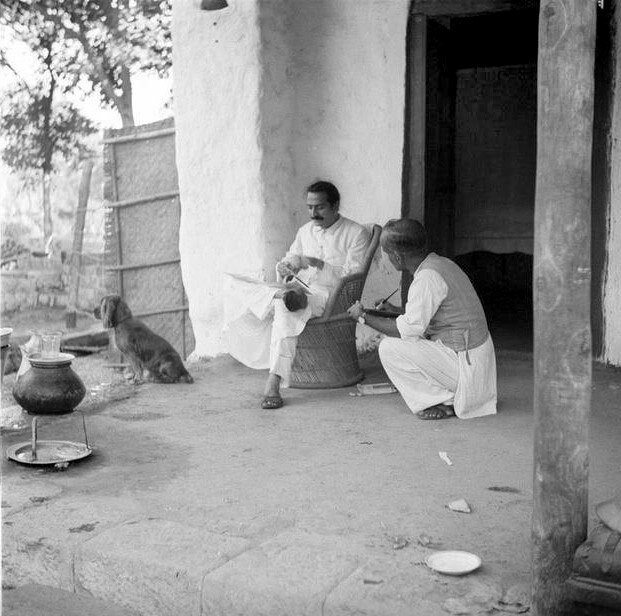 This was a phase when Baba was having many temporary structures He had had recently built at Meherabad pulled down. Padri would describe how at times some of the men mandali would be building something at one end, while other mandali would be pulling it down at the other end! 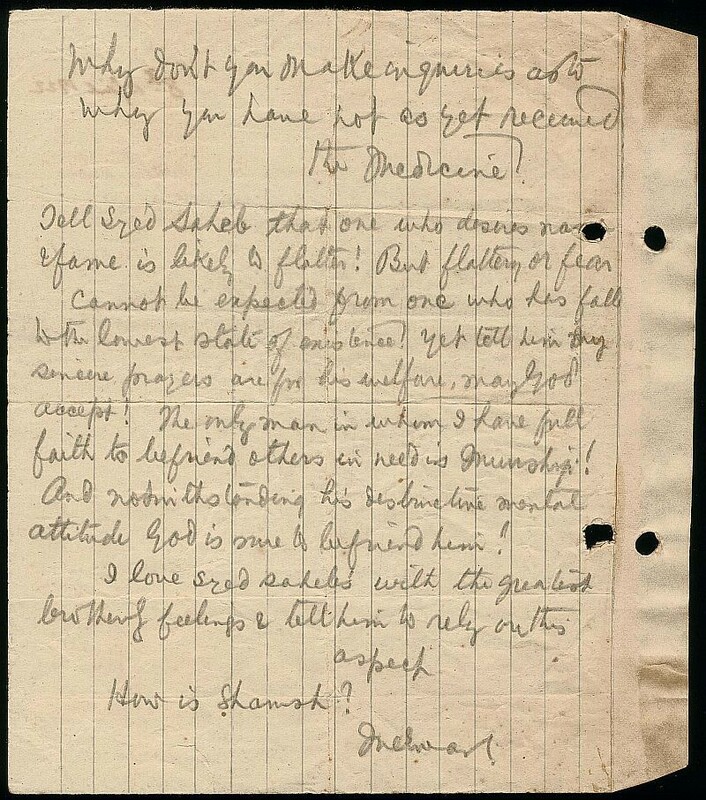 Our Heart Talk posting this week from Baba to Dr. Ghani is undated, but was written by Baba from Meherabad in mid-December 1925. "The world teacher of Mrs. Besant" refers to J. Krishnamurti, who was hailed as such by Dr. Annie Besant and the Theosophists, but about whom, Baba later commented: "It is all humbug. 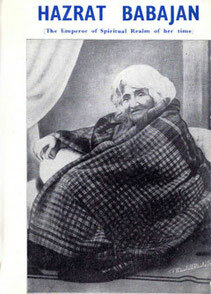 The Theosophists, including Mrs. Besant and Krishnamurti, do not have even a whiff of the Truth." 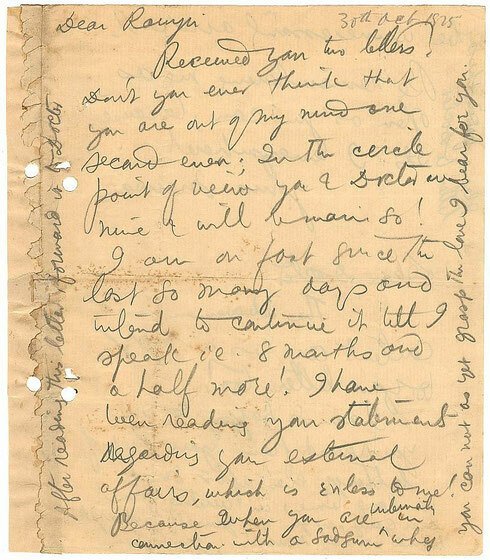 This Heart Talk, dated 13th March 1926, was written by Baba at Meherabad to Dr. Ghani and Ramjoo. During this period Baba had His 'Seat' in the cabin at the Sai Durbar platform. This cabin had been constructed for the celebration of His Birthday in February 1926, which was attended by many people. 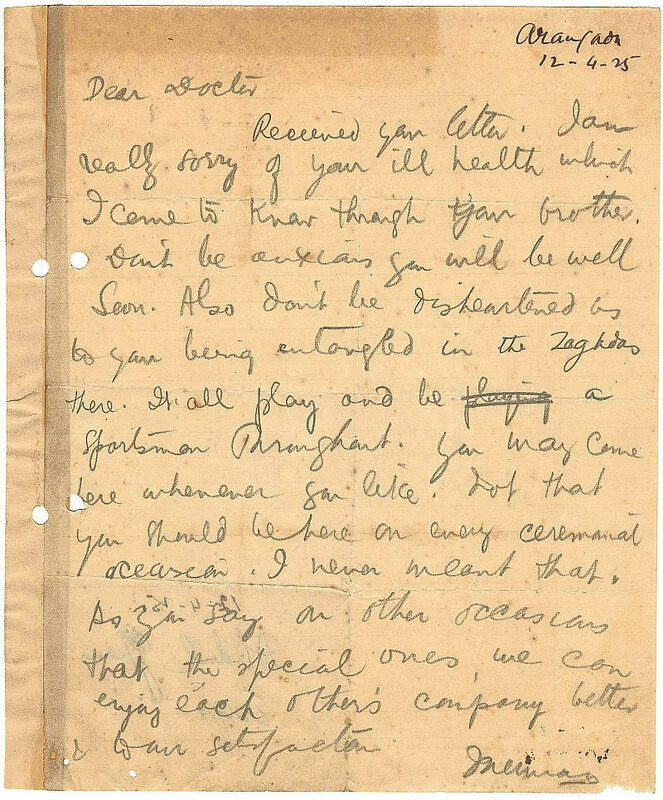 The Gujarati script In the second sentence of the letter translates into English as "dedication ceremony" of a flour mill at Khandala that Ramjoo and Ghani owned, and which Baba visited later that year. "Ghani and Jal have won, that is what I feel. The last word that Jal uttered as he breathed his last was 'Baba.' How fortunate. Indeed, such cases are rare."